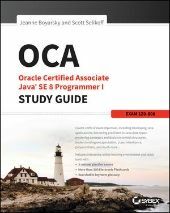 Please note my book comes from the Certification Kit (OCA+OCP). I guess this is kind of a "2nd edition" as many errata mentioned here seem to have been corrected. Error : In bullets 3, 5 and 7, "y taking a new value of ..." should be "count taking a new vale of ..."
Error : In bullet 3, "= (1 + 4) % 3" was corrected to "= (1 + 5) % 3"; but the real error was on the next line which should be "= 5 % 3" instead of "= 4 % 3"
Error : "initialized" should maybe be replaced by "declared"
Error : "floating-point integers" should be replaced by "floating-point numbers"
Error : "boolean" should be "Boolean"
Error : "Wolf overrides the parent class Canine" should be "Wolf extends the parent class Canine"
Error : "marking a method" should be "marking an interface"
Error : "The expression on line 5" should be "The expression on line 6"
Error : I am not sure about option C : shouldn't the accessor be named "getNumberWings" in order to be correct ? Is shortening really allowed ? What should I answer if I stumble upon such a question on the real exam ? Error : I think A should not be a valid option as the question makes a clear distinction between "allowed" and "required"
This is great to hear. We knew the publisher was doing a second printing with the errata corrected, but didn't know when it was coming out. The fact that it is in your hands answers that question! Have a cow for all the comments. We'd rather get more feedback rather than less. No, the book is correct. "y" is correct. The count and y variables get different values. In particular, count is just incremented by 1. Whereas y has the results of math assigned to it. Which is what the bullets describe. You are correct. Congratulations on reporting the first "second printing" errata! Logged. Correct. As you noted, it is in the errata. We didn't get that one to Wiley so it didn't get corrected. You are correct. There is no such thing as a floating-point integer! Added to errata. The sentence we are talking about is "The result of x * y will then be automatically promoted to a double, so that it can be divided with z, resulting in a double value", right? If so, this is correct. The code is x * y / z. So the result of the multiplication is being divided by z. Thanks. They tried to fix it at least! Noted. We have a private list of things that aren't wrong per se, but could be better. Noted on our private list. With auto-boxing it doesn't really matter, but it would be clearer. That is true. It's omitted because we haven't covered exceptions/unreachable code yet at this point in the book. It's also out of scope for the exam. I think we meant overrides a method in. I added it to our private list. While it is wrong, it was more of an explanation thing. And the idea is at least clear. I don't see this. #4 does say marking an interface. #5 says marking a method, but that one is about methods. Replying to the mock exam ones in a separate post. You are correct. Good observation. Added to errata. It is allowed. There isn't a rule that the method and variable names need to match. It depends on your compiler. Some stop earlier. Our private list says to change the form of the question to "what is the first line not to compile." On the real exam, they tell you how many answers are correct so this situation doesn't arise. Others took issue with this too. It's an English problem. While I don't think it is wrong, so many people did that it clearly is confusing so we'd rewrite that question in a Java 9 edition. Introduction, page xxxviii, Q17, option D, closing parenthesis is missing. page 126, reads: 'which half the target it IS' -> 'which half the target is IN' ? page 138: 'California is three hours earlier than New York…' -> er… 'is 3 hrs BEHIND New York'? We aren't taking anything off the website errata list. We are considering adding a second column for "fixed in second printing"
There are three open parens and three closing parens. One close parens is after the variable "i" and the other two are at the end. I'm not seeing that in my copy. Can you include a few more words in the sentence to ensure I am looking in the right place. Also, at the very beginning of the book, there's a page with copyright, editors, etc. The last line is a bunch of numbers counting down from 10. Can you reply with those numbers say in your copy. (This will tell me which printing of the book you have in your hands.) I'm wondering if you actually have the second printing and that got broken while fixing something else. Good eye! Added to errata. Correct. Added to errata. And again, good eye! This is an English thing. Either is correct. It is currently 2:30pm in New York and 11:30am in California. Making it earlier in California in terms of looking at a clock. It's fine for you to think of it as "behind" as long as you understand the concept. But it's not wrong. I Just looked it up and you are right! Also, 1.1 should be 1.0 in that paragraph then! Which you can see clearly is nanos. – nanos: I agree, that must be an unfortunate coincidence. There are some other typos, too; will send them up as soon as I finish placing my own OCA Cert book on the CreateSpace platform; in a week or so. page 241: "the Java compile performs" -> "compiler"
page 287: "You’ll see that without such rules in place, it is easy to construct an example with polymorphism in Java." -> probably: "…it isn't easy to…"
page 203: "read to construct" -> no problems with the code or its output but "ready to construct" would be more appropriate semantically. "At runtime the child version of an overridden method is always executed for an instance regardless of whether the method call is defined in a parent or child class method. In this manner, the parent method is never used unless an explicit call to the parent method is referenced, using the syntax ParentClassName.method()." Right now this syntax – ParentClassName.method() – covers only one scenario, where both parent and child methods are static, otherwise the code won't even compile. IMHO, the call should be made via a parent object (as in new ParentClassName().method() and so on), which would cover both scenarios, that is, with static and instance methods alike. "The interface takes two int parameters. The code on line 7 attempts to use them as if one is a StringBuilder." 1) Interfaces do not accept params; methods do -> "The [functional] method takes…"
2) This one is major. The question is supposed to test us on lambda-related subjects but misses the target altogether. The dead giveaway is append().isEmpty(): this chain will never compile since isEmpty() is defined in String rather than StringBuilder -> whatever else the code's doing – say, is it 'lambding' properly or not – is actually irrelevant. Replacing isEmpty() with equals("la-la-la") – because equals() is the only method in SB that returns a boolean – would be also too conspicous… (sigh)… Anyways, this LOC needs some camouflaging. Agreed. Added to errata. It's not a big deal since it is in a comment, but yes it was intended to match the class name. Noted on our private list since the meaning is clear. Again on private list. Thanks. The second printing changes this to super.method(). new ParentClassName().method() wouldn't be correct. Because that would call it from outside the class and lose any state. This is fine. First of all, we are talking about a single abstract method interface. So it is obvious we are talking about the method in the interface. Second, we are testing knowledge of types and lambdas in conjunction. Which you saw. So you did notice part of what we were testing and it is fine. Good find. This has in fact been wrong all along. It kept escaping me. Ah. This was a regression error on the second printing. That phrase was used twice so the publisher corrected both instead of just the one that was wrong. I understand that it's allowed and there is no rule saying they need to match. I just want to point out that Table 4.5 "Rules for JavaBeans naming conventions" (p. 206) in the book seems to state otherwise. The method name must have a prefix of set/get/is, followed by the first letter of the property in uppercase, followed by the rest of the property name. Following what this says, it seems getNumWings() shouldn't be a valid choice on the Chapter Review Question, especially beings the question specifically asks about JavaBeans naming conventions. Since the type of the ArrayList isn't a int but an Integer (wrapper class) its possible to add null to it. So Answer B should be wrong! I believe the issue isn't with adding null to the ArrayList. The problem is in line 9. The program would try to unbox the null to an int in the loop, as ages contains Integer objects, thus throwing the NullPointerException. You're right Jeremy. I got confused because in the explanation is written "Line 8 does not because null is not an int.". So the 'does not' referes to 'does not unbox'... I understood it as 'does not compile' because it's written right after it. But this is already in the Errata. Jeremy Walker wrote: Following what this says, it seems getNumWings() shouldn't be a valid choice on the Chapter Review Question, especially beings the question specifically asks about JavaBeans naming conventions. Table 4.5 is incorrect. It is legal (but less common) for a boolean getter to begin with get rather than is. This means that line 14 is just fine as a boolean getter. Jorma Spitz wrote: You're right Jeremy. I got confused because in the explanation is written "Line 8 does not because null is not an int.". So the 'does not' referes to 'does not unbox'... I understood it as 'does not compile' because it's written right after it. But this is already in the Errata. Correct. Thanks for pointing this out. All: Feel free to start a new thread when you spot something. Everything about the book doesn't have to live in this thread . Except that the errata does not refer to using a partial name (i.e. getNumWings() vs. getNumberWings()), at least that I see. It only references the boolean get/is issue. Also, I believe the book I quoted from is the copy with most of the errata fixed, including the one you referenced. Option F is an Error and so should not be caught or declared. Error extends Throwable. Throwables (except for Exceptions) shouldn't be caught so from the point of view of the exam, this is still correct. I'm closing this thread as it is starting to look like the official place to report all errors. It's hard for me to manage what I've read in a giant thread. Please create a new thread in this (the OCA forum). Just mention "Sybex" in the title to ensure I see it. You might mention a page number or chapter number in the subject too. If you have multiple things to report at once, it's fine to put them in one thread. It's just the "one thread of everything that goes on for months" that I'm struggling with.